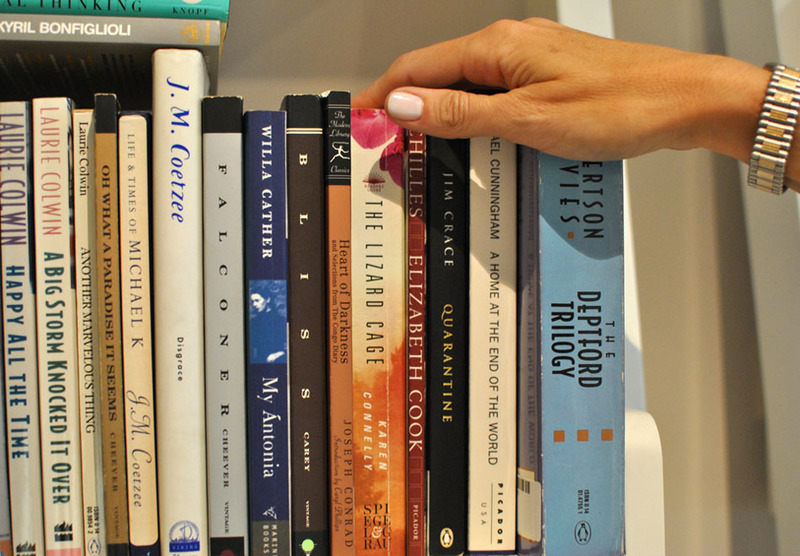 Shelf Esteem is a weekly measure of the books on the shelves of writers, editors, and other word lovers, as told to Emily M. Keeler. 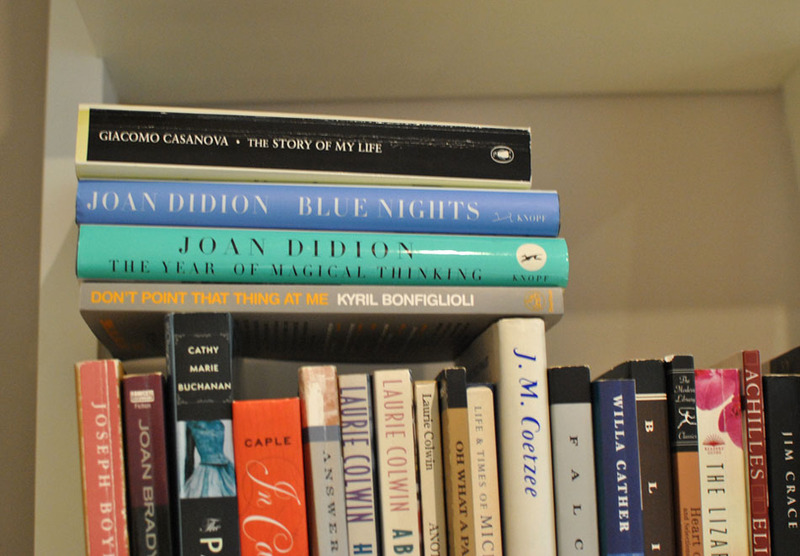 This week’s shelf belongs to Mary Osborne, the Executive Director of the Writers’ Trust of Canada. This year is Osborne’s first with the Writers’ Trust, which administers programs and privately funded literary awards in support of Canadian literature, including the Journey Prize and the lucrative Hilary Weston Prize for Nonfiction—the shortlist for which had just been announced the day before I visited her personal library. Osborne was previously the Managing Director of Shakespeare on the Sound, in Connecticut. Her shelves are in a home office in her apartment in midtown Toronto. I have my bookshelves kind of hidden away. It’s just the way it worked out in this space. 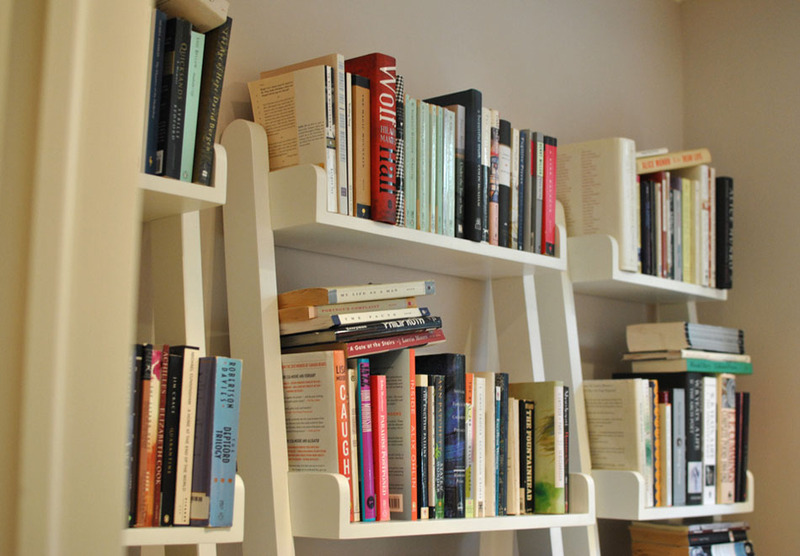 I’ve moved from a big house in Connecticut, which had walls and walls of built-in bookshelves. Here, there’s no obvious extra space. So I ended up taking this room, which used to be a walk-in closet, and making it into my little office. I may be short on space for clothes, but at least I’m able to get a little bit of book space in here. Because I scaled back when I knew I’d be moving from a big house to an apartment, most of the things here are here for some reason. I love them, or they remind me of something, or whatever. There are a few books that I’ve brought because I haven’t read them, but they’re on a list of things I’d like to read, and some of these books have come in through work. You can see from all the broken spines that I attack my books. I don’t show them any physical respect. A lot of people are totally offended by that, they think they’re objects to be treasured. But I don’t have any issue with dog-ears or broken spines. 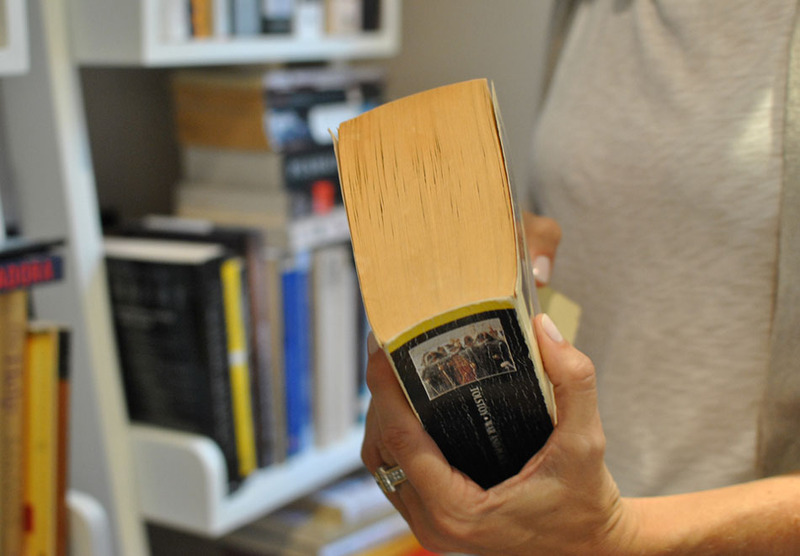 If you look at a book, like War and Peace, which I read—not for school, or anything, but when I read it I felt like just the sheer size of it makes you feel challenged in reading it. You can’t help but approach it with a sense of burden. As I was reading through it, I was thinking, it’s a slog, it’s a slog, I didn’t feel like I was loving it. And then look at how many pages I’ve tabbed. You can see that the farther I got into the book, the more I seemed to like it. And then, you go back and try to find the thing you liked on the page. In here, the number one thing that I wanted to remember, to get the quote exactly right—I cannot find it. I have probably 300 page tabs in this book, and none of them seem to be for the quote that I wanted. It’s the part where they’re talking about this character, Pierre, and basically the idea that the qualities that make for the ideal man are the very qualities that make you unfit for war. Love, poetry, tenderness, and a philosophic and abiding doubt. I just can’t remember exactly how it was said, but it’s a nice notion. You look at the George W. Bush types in the world, and they’re as far from that ideal that you could get. I have always read much more fiction than nonfiction. I’ve just started to develop an appetite for nonfiction, because my work has exposed me to different things in a new way. Now that I have things landing on the submission shelves in my office, I’ve been picking nonfiction up and finding that I really love some of the books. Yesterday we announced the shortlist for the Hilary Weston Prize. 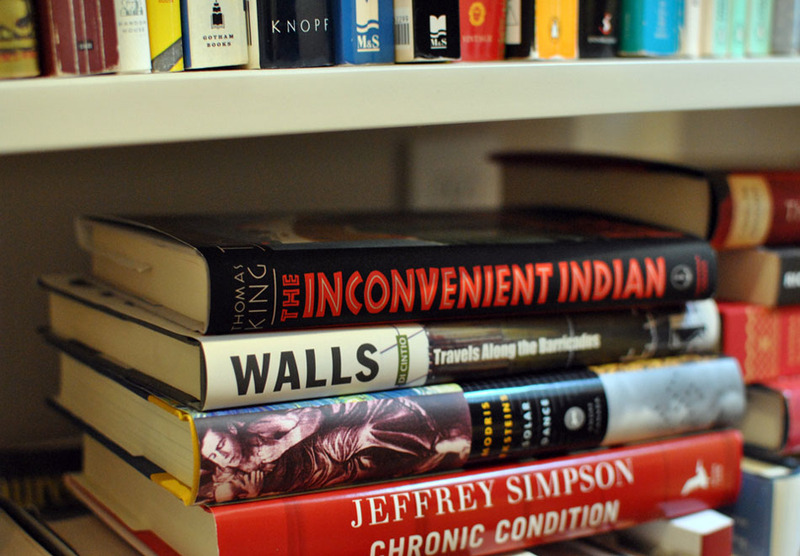 The Inconvenient Indian is the only one that’s been out for a while, and I read that in hardcover in the spring. And I loved that book. On my own, I normally wouldn’t have picked it up. I was in Connecticut, but before that I was in New York, and before that I lived in Paris. In each move, I’ve left so many books behind. Moving from Paris to New York, I didn’t bring anything, so all of the French books are gone. I might have a couple in here. You can pick them out from the spine. English books have the title going one way on the spine, and French books are the other way. Do you know why that is? It seems to me like a really odd thing. The French way makes sense to me; I feel like it’s easier to tilt your head to the left. Maybe it’s just me. But it seems like an odd thing. Joan Didion. I absolutely love that book, The Year of Magical Thinking. They turned it into a play in New York where Vanessa Redgrave played Joan Didion. It’s a one-woman show, just her on a very simple stage, and she recites the book. As a feat of memory, it was quite impressive. But I actually felt that this book, I could just relate to it in so many ways, but the way Vanessa Redgrave delivered it compared to what I had in my head, the tone that I thought Joan Didion would have been telling it in, I felt like it was just completely off. Although I know Joan Didion was involved in the whole rehearsal process, and I think she was thrilled to have Redgrave in the role. I felt like it just took away so much of the power of the book. The Lizard Cage is one of my favourite books. I’ve recommended it to so many people. It’s so moving. It actually nearly got a friend fired. My friend works in a strange independent bookstore in the States, with a weird owner who forbids the salespeople—a bunch of people who all love books and have all kinds of ideas on their own—from recommending books that she hasn’t recommended herself. She hadn’t read The Lizard Cage. So, a friend of mine was talking to somebody who was planning a trip to Tibet. She said, you have to read The Lizard Cage, and the customer said she hadn’t read it, and they didn’t have it in the store. My friend said they’d order it and send it to her. The woman was on her way to Vermont, and they sent to book to her new address. She sent an email back to the store saying I don’t remember the name of the staff person, but I just want to say thank you for the incredible recommendation. This has meant more to me than any other book I’ve read in my life. And the owner was upset, wondering who had recommended the book! 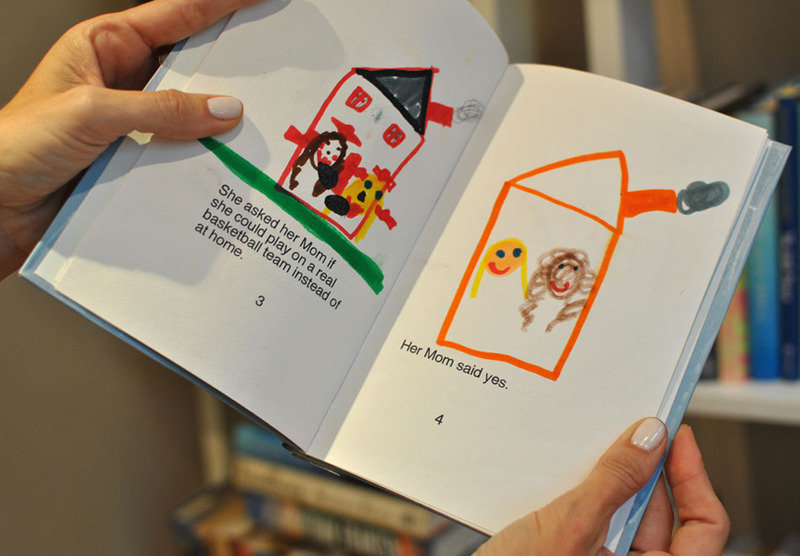 This is my daughter’s book. The Girl Who Loved Basketball. She’s 19 now, so she’d be horrified. This is the creativity, “her mom said yes.” You’ve got my blonde hair, and her curly brown hair. So that’s another example of holding on to a book for a memory. She’s not much of a baseball fan anymore. Both my kids were here for the film festival the other week. We had a great time. That’s one of the things I feel very lucky about. We’re all in sync on the literary front. Their father is more a math-head, but both my kids like to have books all around. My mother’s the same way. It goes through the generations. Shelf Esteem runs every Tuesday, usually.